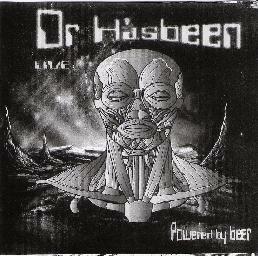 Dr. Hasbeen - "The Alien Within" / "Powered by Beer: 1998-2000"
Technicians of spaceship Earth, take note: the legacy of Hawkwind lives on in Dr. Hasbeen's two newest releases. If you're looking for the psychedelic meltdown euphoria of The Space Ritual or the earth-shattering space rock of Doremi Fasol Latido, your search is over. Powered by Beer, a collection of live tracks from various venues between 1998 and 2000, evokes fond far flung memories of Hawkwind at its best: blasting off live in all its acid glory for the heart of the sun. The Alien Within, on the other hand, trims off some of the fiery excesses of the live disc, refining the smoldering remains into a burning gem of rock hard semi-precious metal. The live Powered by Beer features Spacehead refugees Paul Boars (drums) and Mr. Dibs (synths) and spotlights the Doctor himself Martyn Needham (guitars, synths, keyboards, vocals). Though there are some minor glitches here and there in the recording, the eight tracks on Powered by Beer form a massive attack of metalized guitars, pounding drums and swirling synthesizers. Additionally, the recording quality and mix is exceptionally good for a live set. The Calvert-esque spoken intro "System Check/Final Flight" segues nicely into the blistering heavy rock of "Marriage of Heaven & Hell," a song that would've easily fit right into the track list of Doremi Fasol Latido. The super accelerated version of "Urban Guerilla" far exceeds the original in manic intensity, so much so that the frenetic pace of the rhythm section virtually propels the listener through a black hole of pure stereophonic destruction. You better watch out for those asteroids hurtling toward you at light speed. "They Call Me the Doctor" features some blazing guitar licks framed by gurgling electronics and power drill drums. "Techno & Greed" appropriately brings the high watt hurricane to a thundering close. Imagine the Dead Kennedys locked in mortal combat with Hawkwind somewhere out beyond Alpha Centauri and you've got a good picture of the chainsaw mayhem created by the dual power drive of Needham's and Daz Fletcher's guitars. In sum, Powered by Beer is an essential document in the Hasbeen canon of astral voyages and trans-dimensional trips. If the non-stop frenzy of Powered by Beer doesn't leave your brain stem completely scorched, The Alien Within should immolate what's left of it, including the rest of your entire central nervous system. Starfleet space cadets will be ducking the phasor beams and dodging photon torpedoes while listening to such crushing space anthems as "Time Wheel," "Hippy Trip" and "Space Riders." Each of these songs jettisons the vicarious star voyager into spiraling realms where turbo-driven guitars collide head-on with the meteoric blaze of ion-fueled synths. The high energy "Hippy Trip," in particular, with its locomotive Dave Brock-inspired blues scale, plays out like a close cousin to "Kings of Speed." The two Hawkwind covers, "Flying Doctor" and "Psi Power," are well-executed; however, neither surpasses the original versions by the mother ship. The near ambient "Lords of Darkness," with its sinister invocation and arpeggiated synth line, is strangely reminiscent of Hawkwind circa The Chronicle of the Black Sword. The more down-to-earth, semi-acoustic tracks, particularly "What Can I Say" and "The Alien Within," create a welcome counterbalance to the otherwise merciless barrage that Needham and crew inflict on the listener. "Axis of Evil" is a fitting final destination to the power cruise that The Alien Within takes you on. A Calvert-like Captain Lockheed rocker, "Axis of Evil" fire bombs the perimeters of your stereo field with prophetic warnings of a future Islamic blitzkrieg from dark forces waiting to be summoned by the voice of Allah. The apocalypse is coming soon to a theatre near you, but if you want a preview, this is it. Recorded entirely live in the studio, The Alien Within fires on all cylinders and should be essential listening for anyone interested in the recent development of post-Hawkwind aerospace age rock 'n' roll. And it leaves no doubt that Dr. Hasbeen has solidified its reputation as both a blast from the past and a fist for the future. For more information you can email Dr Hasbeen at: drhasbeen7@aol.com. 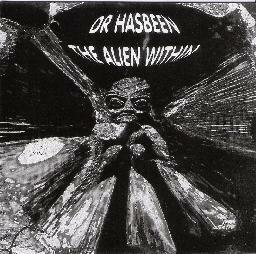 Contact via snail mail c/o Dr Hasbeen; 34 Hallfieldgate Lane; Shirland; Derbyshire; De556AA; England.